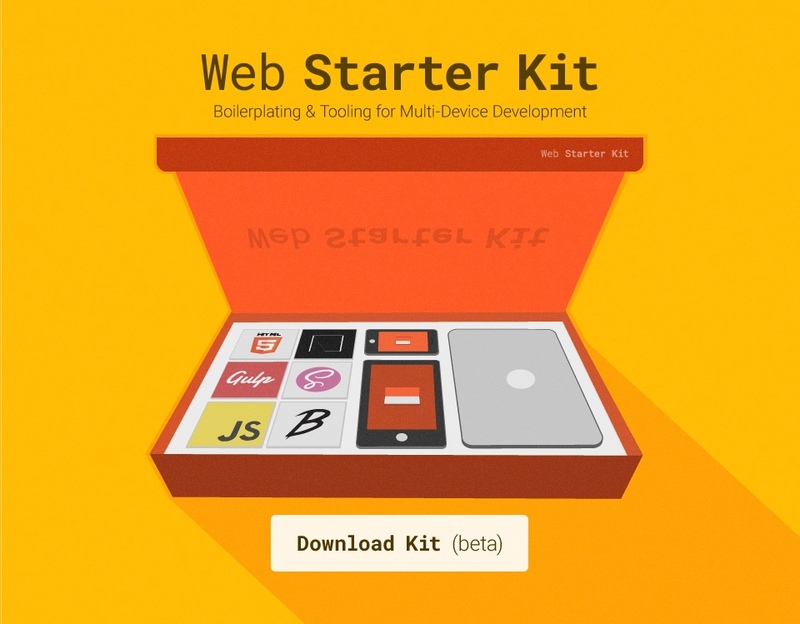 Web Starter Kit is an opinionated boilerplate for web development. Tools for building a great experience across many devices and performance oriented. Helping you to stay productive following the best practices outlined in Google's Web Fundamentals. A solid starting point for both professionals and newcomers to the industry. Responsive boilerplate A responsive boilerplate optimized for the multi-screen web. Powered by Material Design Lite. You're free to use either this or a completely clean-slate via basic.html. ES2015 via Babel 6.0 Optional ES2015 support using Babel. To enable ES2015 support remove the line "only": "gulpfile.babel.js", in the .babelrc file. ES2015 source code will be automatically transpiled to ES5 for wide browser support. Offline support Thanks to our baked in Service Worker pre-caching, sites deploying dist to a HTTPS domain will enjoy offline support. This is made possible by sw-precache. Download the kit or clone this repository and build on what is included in the app directory. index.html - the default starting point, containing Material Design layout. Be sure to look over the installation docs to verify your environment is prepared to run WSK. Once you have verified that your system can run WSK, check out the commands available to get started. Web Starter Kit strives to give you a high performance starting point out of the box. Our median Web Page Test scores for the default template have a Speed Index of ~1100 (1000 is ideal) and a repeat-visit Speed Index of ~550 thanks to Service Worker precaching. This is not to say that Web Starter Kit cannot be used in browsers older than those reflected, but merely that our focus will be on ensuring our layouts work great in the above. If you find yourself running into issues during installation or running the tools, please check our Troubleshooting guide and then open an issue. We would be happy to discuss how they can be solved. If you would prefer not to use any of our tooling, delete the following files from the project: package.json, gulpfile.babel.js and .travis.yml. You can now safely use the boilerplate with an alternative build-system or no build-system at all if you choose. File Appendix - What do the different files here do? Deployment guides - available for Firebase, Google App Engine and other services. Gulp recipes - the official Gulp recipes directory includes a comprehensive list of guides for different workflows you can add to your project. Web Starter Kit is inspired by Mobile HTML5 Boilerplate and Yeoman's generator-gulp-webapp, having taken input from contributors to both projects during development. Our FAQs attempt to answer commonly asked questions about the project. Contributions, questions and comments are all welcome and encouraged. For code contributions to Web Starter Kit, please see our Contribution guide before submitting a pull request. Website related issues should be filed on the Web Fundamentals issue tracker.